An executive order signed by President Trump on Tuesday orders a review of the H-1B visa program for highly skilled workers. It won’t have an immediate effect on the tech industry, but could benefit local tech giants and startups alike. An executive order by President Donald Trump designed to restructure a visa program for highly skilled workers that is used largely by the tech industry will have little immediate effect, Seattle tech leaders said Tuesday. It does signal tighter enforcement of high-tech visa applications ahead, but that may end up working in favor of local tech giants and startups alike. 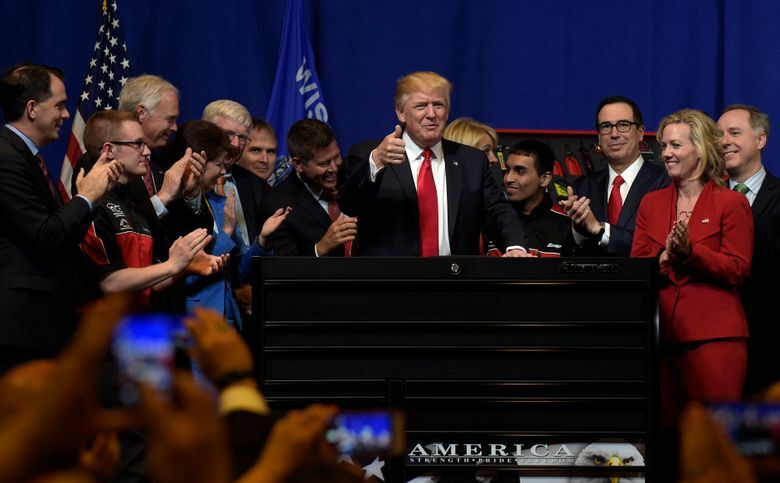 The “Buy American and Hire American” order signed by Trump in Wisconsin on Tuesday afternoon orders several federal agencies to review the high-tech visa, or H-1B, program. The Trump administration says it undercuts American workers by bringing in large numbers of cheaper foreign workers, who drive down U.S. wages. The executive order directs U.S. agencies to propose rules to prevent immigration fraud and abuse in the program. The tech industry has long said it relies on the H-1B program to fill job openings at their growing companies because there aren’t enough U.S. workers available with the specific talents that are needed. Critics disagree, asserting that some companies use the high-tech visa program to bring in lower-paid workers who have the same skills as U.S. workers. Many critics focus on outsourcing companies’ use of the program. The top three recipients of visas are outsourcing firms, who hire workers and contract them out to other companies. Their visas are usually for lower paid entry-level positions. “Right now H-1B visas are awarded in a totally random lottery and that’s wrong,” Trump said Tuesday in Kenosha, Wisconsin, where he toured tool manufacturer Snap-on. Companies’ visa applications are put into a lottery that allocates 65,000 visas each year. An additional 20,000 visas are reserved for graduate students from U.S. universities. Nearly 200,000 H-1B applications were submitted this year. That was down about 15 percent, or roughly 37,000 applications, from 2016. The numbers might have dropped this year because of greater scrutiny of the program. Or companies may have been discouraged by lottery results, which mean a less-than-30 percent chance of receiving a visa. The visa-review announcement came at a jittery time for the White House, as Trump faces the 100th day of his presidency without much to show for it in the way of legislative accomplishment after the defeat of his health-care bill. And his two high-profile executive orders cracking down on immigration from predominantly Muslim nations have been stymied by the courts. Rep. Zoe Lofgren, D-Calif., whose district includes Silicon Valley, said the issue of foreign workers was real but dismissed the president’s order as poorly targeted and unlikely to achieve its desired result. In a briefing with reporters Monday, White House officials said the “Buy American and Hire American” order would also overhaul federal procurement practices to increase the selection of products from U.S. companies, especially in the domestic steel industry, which has faced stiff competition from China. Even if Democrats question the effectiveness of Trump’s order, some countries that have been sending workers to the United States are bracing for big changes. A top information-systems services company in India is planning to create development centers in the United States to train local talent in an effort to address the visa- regulation changes, according to Reuters. Many tech leaders agree that the H-1B program needs reform, and they hope changes will work out in their favor by leaving more visas for large tech companies and startups, instead of outsourcing firms. Schutzler is hopeful the review will reduce abuses by outsourcing firms, leaving more visas for other tech companies. In Washington state, Microsoft and Amazon are the leading applicants for the high-tech visas. Microsoft applied for 4,294 last year, and Amazon applied for 2,552 visas. Some changes to the visa program that the White House has suggested can be accomplished within Trump’s administration, and others will require legislative action. “I think the lottery, next year, is gone,” said Greg McCall, an immigration attorney and partner with Perkins Coie in Seattle, noting that the administration does not need congressional approval to change that part of the process. In its place, there could be an auction that gives visas to the highest-paid positions first or that may favor applicants with advanced degrees earned in the U.S., he said. Companies that apply for visas will have to be mindful of every detail in their applications, but the rules are likely to favor many tech companies and restrict access by outsourcing firms. Seattle startup CEO Manny Medina said many of the visas that outsourcing firms win are used for jobs that could easily be filled by U.S. workers. Medina, who leads sales-automation company Outreach, said it’s possible the executive order will mean fewer visas for outsourcing companies and more available for startups, who work to hire people with specific, harder to find technical skills. There’s no doubt that the H-1B program needs to be reviewed, said Amelia Swan, legal counsel at Kirkland cloud startup BitTitan. The startup applied for four visas this year, for positions they say they couldn’t find a U.S. worker to fill. The extra oversight of the program will not be a problem for BitTitan. Information from The Associated Press and The New York Times is included in this report.